Lately I have been putting a lot of effort into meal planning. Meal planning is important for us for several reasons. We’re trying to save money for a house, so we realized one area we could cut back is dining out and food expenses. Typically, we’ll be really good at food shopping for a few weeks, and then run out of food, get lazy and end up at the Whole Foods hot bar every night (which is expensive!). Meal planning has the added bonus of helping us maintain a healthy diet instead of indulging when we have nothing at home. We created a budget of $125 a week for groceries and $50 a week for date night dinners. We also allotted a small amount of money for going out with friends and entertainment activities. This budget is pretty sparse, but we’ve done well sticking to it so far. 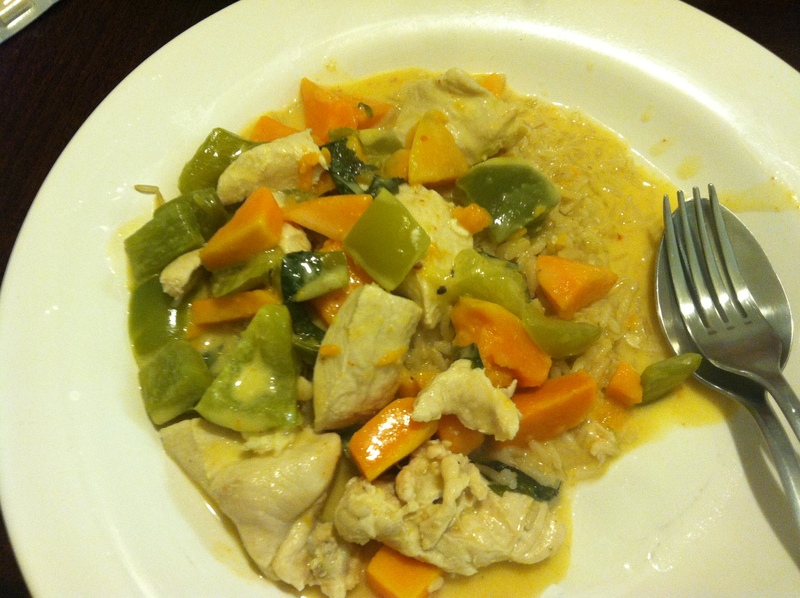 Thai Chicken Curry – I saw this recipe on fantastic food and it’s amazingly simple! The curry sauce is made from mixing coconut milk (you can use light coconut milk), sriracha and chili spices and the recipe includes sweet potatoes, green bell peppers, and rice. 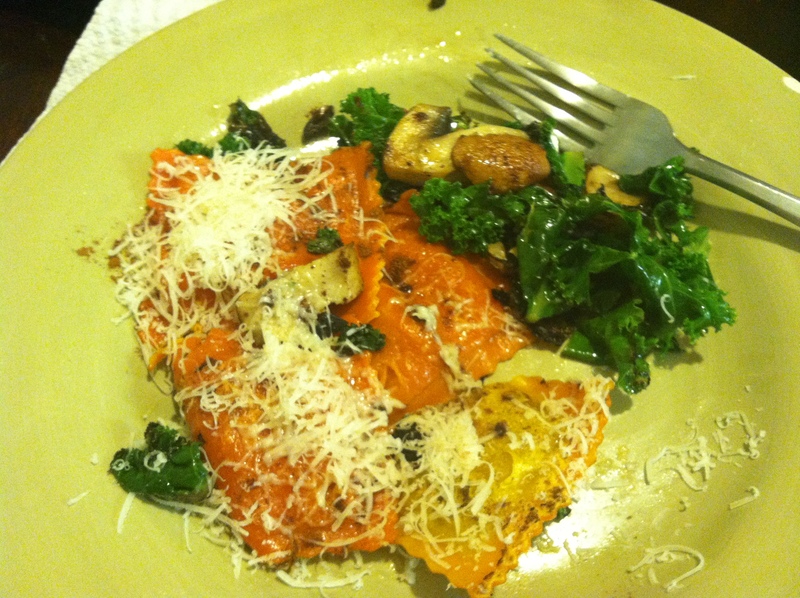 Honey Pumpkin Ravioli, topped with parmesan, with a side of kale and mushrooms. Not the prettiest meal, but this was delicious! We bought pre-made honey pumpkin ravioli from Trader Joe’s after taste testing it. While it was delicious, we probably wouldn’t have it regularly since it’s not as healthy as our typical dinners. A simple salmon dish with a Greek salad on the side. We got a great deal on salmon, so decided we’d include it this week. It was delicious and easy to make. So far our strategy has been to decide what dinners we want during the week and picking up the ingredients for those meals and some extras for breakfasts and lunches. This might sound pretty simple, but for someone who has thrown together meals on a nightly basis based on what’s lying around the kitchen, it’s a new experience. This week we picked up the ingredients for stuffed bell peppers, meatloaf, burritos, Thai Chicken Curry (Brandon can’t get enough of it! ), a chicken dish, and salads for lunch. So far meal planning is really helping us eat healthier and stick to our budget so it’s a practice I’d like to keep up! One of the ways I’m trying to make healthy changes in my life is to get better at meal planning. 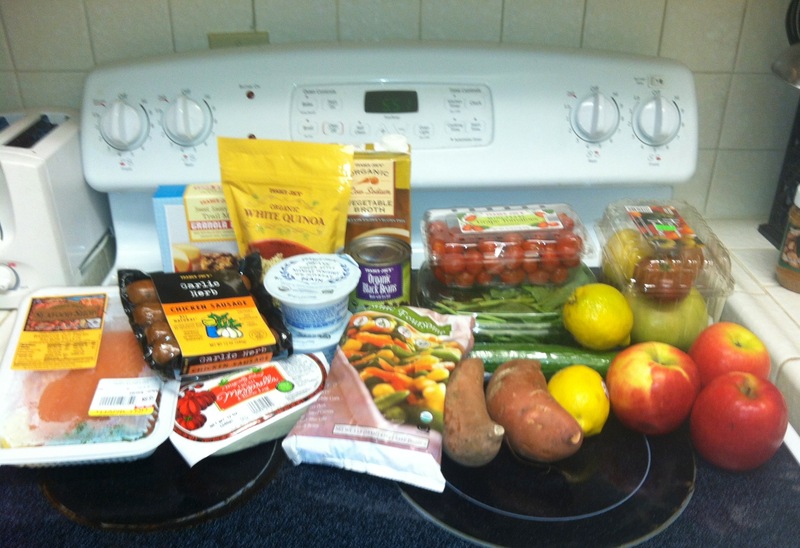 I used to buy the same ingredients every week without any specific meals in mind and wing it. What resulted was a lot of hodge podge meals and sometimes sticking to snacking when I didn’t have enough to put a “real meal” together. 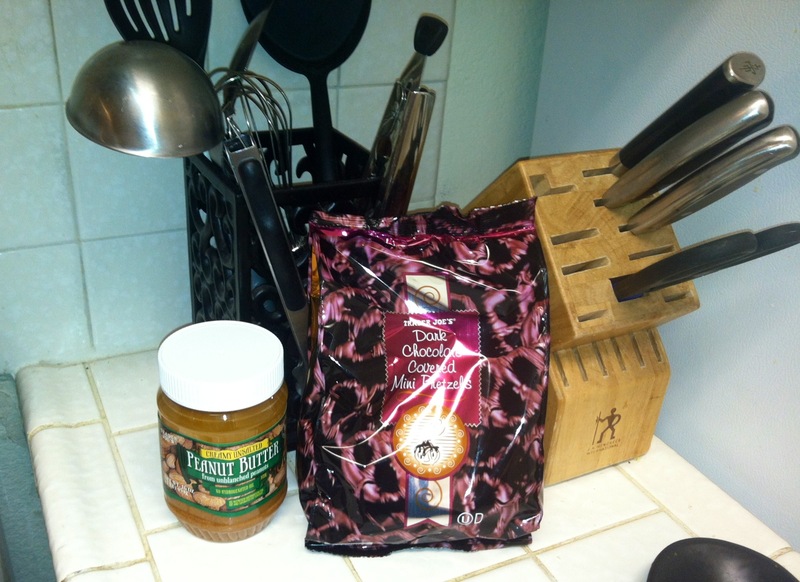 Dark chocolate covered pretzels dipped in peanut butter! Yum. Obviously, I have other items in my kitchen already including brown rice, whole wheat pasta, canned goods and some vegetables and fruit left over from my last grocery store trip. I have several meals planned for these items including a caprese salad, pasta with chicken sausage, kale and garlic, and chicken with chickpeas and grape tomatoes. I hope that having these meals planned in advance will help keep me on track. 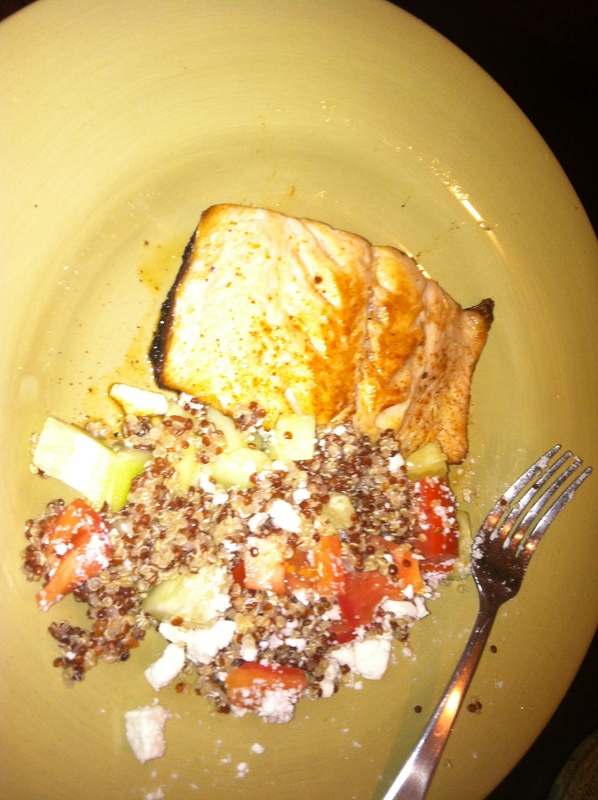 Salmon cooked in oil, garlic and lemon and quinoa with basil, cucumber, feta, grape tomatoes and lemon. The first night of meal planning was a success!